The Goldfinch has continued to increase and spread since our First Atlas and is now the thirteenth most widespread breeding species in Cheshire and Wirral. Compared to twenty years ago, they are present in 92 new tetrads, with just 14 losses, a net gain of 78 tetrads. They have filled in almost all of the breaks in their distribution in central southern Cheshire and there are now no significant gaps. The abundance map, however, indicates relatively few birds in many of these newly-colonised areas. There is a significant cline in their density, with totals of 100 birds per tetrad northwest of a line from Chester to Warrington, decreasing to figures of fewer than 15 birds per tetrad in patches of southern Cheshire and the eastern hills. The average across the whole county is 48 birds per tetrad, and the analysis of Breeding Bird Survey transects shows that this is our seventeenth most numerous species, with a breeding population of Cheshire and Wirral in 2004-05 of 30,440 birds (21,640-39,240). 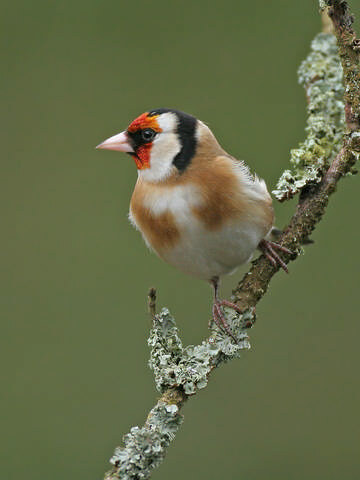 The Goldfinch’s fortunes have undergone massive changes over the last thirty years. A rapid decline in population from the mid-1970s to mid-1980s, in parallel with many other seed-eaters, caused them to be placed on the Amber List of species of conservation concern, but numbers have recovered and their status has returned to ‘green’; the national index in 2004 was 68% up on twenty years before, although still somewhat lower than at the beginning of our First Atlas fieldwork in 1978. These population changes can be explained almost entirely by changes in annual survival rates, probably arising from a reduction in the availability of weed seeds, due to agricultural intensification, and subsequent increased use of other food sources such as garden bird tables (Siriwardena et al 1999). The warmer weather of the last two decades has probably also helped this partial migrant to thrive. Newly-fledged chicks can be very obvious when they beg from their parents, and accounted for 214 of the 304 confirmed breeding records. Their nesting season can extend from April to August, allowing plenty of time for two broods, and occasionally three: a very recently-fledged chick was being fed by parents in my garden (SJ57K) on 1 September 2006. Some of their nests are very well concealed, often precariously placed near to the end of a long branch, but others can be obvious, especially in their favourite specimen trees such as flowering cherry or laburnum. Goldfinch can be one of the commonest species nowadays in suburbia provided that there are some not-too-tidy areas providing seeds of their preferred food-plants, especially dandelions and groundsels early in their breeding season, with burdocks and thistles for later broods. They feed their chicks with regurgitated seeds and a few small caterpillars. This is mainly a bird of farmland (41% of habitat records) and human sites (36%), with fewer in woodland (11%) or scrub (10%).